A background remover tool can be very useful if you like to creatively transform images. 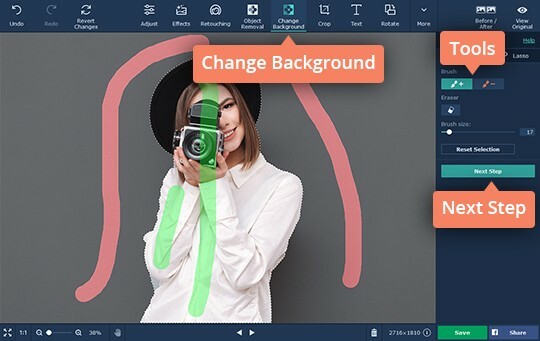 Such apps can help you cut out elements of a photo and place them on a different background. Many of the stunning ads and promo photos you see in magazines would’ve been impossible to create without background removal. Professional photographers often create the original photo with a white background and then remove the white background and replace it with another image. You can also delete the background to get rid of unwanted details or people that accidentally crept into your otherwise perfect photo. Many people think that removing the background of a picture is a tricky task, but in reality it’s not that difficult. All you need is the right software. 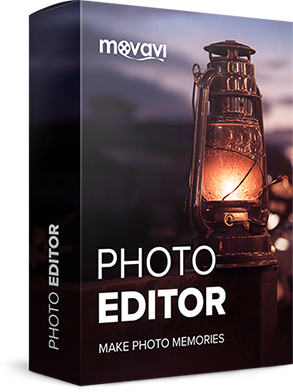 We recommend you try Movavi Photo Editor – a multi-faceted product that will let you extract elements from their background in your photos and do lots of other exciting tasks. 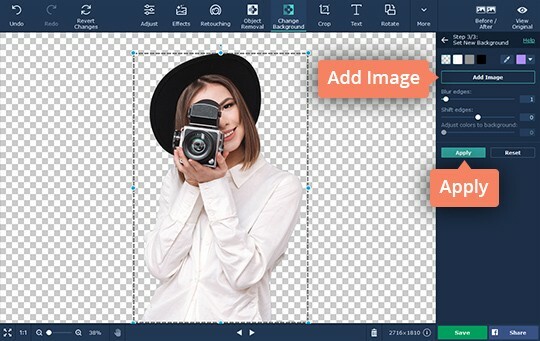 To understand how Photo Editor works, download the program and check out our simple guide below. Open the downloaded file and follow the installation instructions. 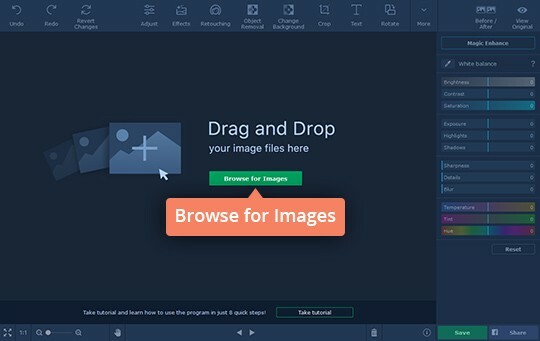 Click Browse for Images and choose the photo you want to work with, or just drag it into the program’s working area. Open the Change Background tab at the top of the program window. Mark the element you need to separate from the background using the green Foreground Brush. Use the red Background Brush to mark the background. You can clear your marks with the Selection Eraser tool and start all over, or use the Lasso tool instead. Eventually, a marquee selection will appear around the object you’ve marked. Once you’ve finished fixing the borders, click the Next Step button. Use the Foreground Mask brush to smooth the edges and the Background Mask brush to mark the areas you want to take out. 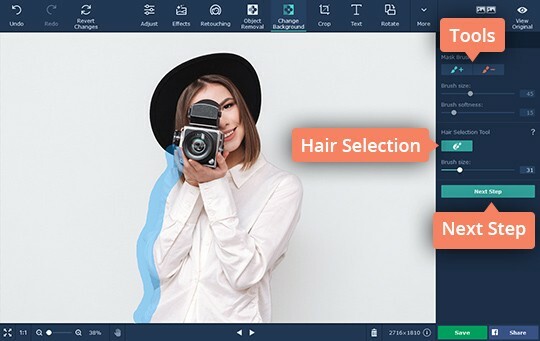 Trace around the selection with the Hair Selection tool to refine hair strands, wisps of grass, and other fine details in pictures. Click Next Step to continue. Your object will then be displayed on a clean background. To put an image into the background, click the Add Image button. In the new window, click Upload to choose a photo from your computer or pick a background from our collection. You can also leave the background transparent or choose any color to paint it as a solid. When you’ve finished editing, click Apply. Finally, you need to save your edited photo. Click the Save button and choose one of the many popular image formats, including JPEG, PNG, BMP, and others. 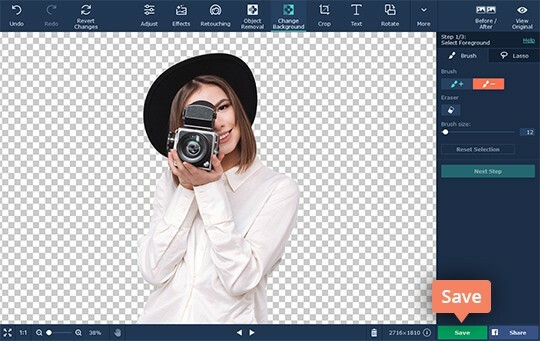 With Movavi Photo Editor, it’s so easy to erase the background of an image, anyone can do it, no matter what your level of computer skills is!